MB Sand Section Beach Classic!!! Living Area 1400 Sq. ft. Lot Size: 1170 Square Ft.
A Beach Classic! 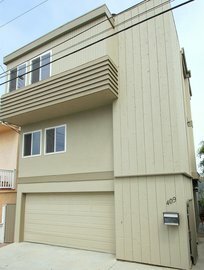 Located just blocks from the ocean, this 2 bedroom and 2.5 bath tri-level home features a bright and spacious living room with hardwood floors and fireplace. The updated gourmet kitchen boasts beautiful granite counter-tops, stainless steel appliances, and plenty of cabinet space. An adjacent deck provides a great space for outdoor BBQ. The master suite boasts fantastic ocean views, and the recently remodeled master bath features granite flooring and countertops. The second bedroom currently functions as an office with a built-in desk and sizeable closet/storage. Enjoy a short walk to the beach, local shops & restaurants, and Live Oak Park.